I’m going there tomorrow. See the old guys. Al Pacino is a brilliant actor with a palmares that stands out from anyone else. No one questions that. His unique characteristic face has been displayed on many movie posters of well-known films. From Michael Corleone and Tony Montana, to Willy Bank. Each time he played an imposing person with charismatic traits. Luckily David Gordon Green could get him for the lead role in “Manglehorn“. It surely isn’t an epic mafia story or crime with a corrupt police force. It’s rather a melancholy character study in which Pacino pulls out all the stops and once again demonstrates what a class actor he really is. But that’s the only conclusion we can draw after seeing this long-winded and actionless story: Pacino is and remains of unprecedented class. The film is a collection of events. It tells the story of an old man who drags himself through life. The story is slow and draped with subtle symbolism and is loaded with the recurrent human feelings of regret and Weltschmerz. Manglehorn is a grumpy guy who forgot the art of interacting with other individuals. His demonstration during the dinner with Dawn (Holly Hunter) speaks volumes. A momentum that made an impression. It looked like a melting pot of emotions summarized in a few moments. Eventually I thought this was a key moment and the most masterful acting from the entire movie. 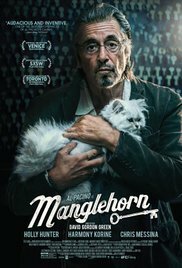 Besides the sometimes artistic-looking images (which reminded me of “Only God forgives” at some particular moments) and the somber character of the film, “Manglehorn” ultimately is nothing more than a series of events about someone who wonders if he made the best out of his life. Superb performances by Pacino and Hunter. But if the end result is simply a proof that Pacino is an exquisite actor, this is a huge disappointment. Because I was already convinced about that anyway !